The first Kadampa Temple was built at Manjushri KMC in England. It was opened by Venerable Geshe Kelsang Gyatso in July 1997. Inspired and designed by Geshe Kelsang and built by Kadampa Buddhists as an offering to future generations, the Temple is an outer reflection of a heartfelt prayer for world peace. Based on the mandala palace of Buddha Heruka, the supreme Buddha of compassion, every aspect of the Temple symbolizes the spiritual path to enlightenment. The four doorways symbolize the four ways to enter the path to liberation, and the eight auspicious symbols show how to progress along that path. The deer and Dharma Wheel symbolize the final stages of the path to enlightenment. The male deer symbolises the experience of great bliss, the female deer the realization of ultimate truth, and the wheel the union of these two realizations. Finally, the five-pronged vajra at the very top symbolizes the five omniscient wisdoms of a Buddha. Just seeing the Temple reminds us that we all have the potential to achieve the highest goals and encourages us to enter into a spiritual path through which we can realize them. 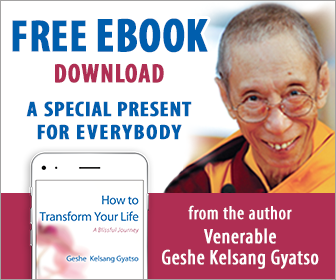 For a detailed explanation of the symbolism of the Temple, see the talk by Venerable Geshe Kelsang Gyatso at the opening of the First Temple. The Temple is the Mother Temple of the New Kadampa Tradition and is host to the annual NKT Spring and Summer International Festivals. It is also the venue for the annual International Teacher Training Program attended by Kadampa Teachers from all over the world.